Date/Time: Wednesday, September 5, 2018 from 6:30 pm - 8:30 pm. Location: Fairfield City Council Chamber. 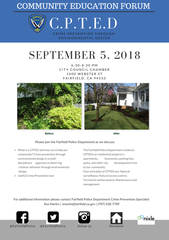 Our Neighborhood Watch groups have been hearing about "crime prevention through environmental design" for the last few years.This month we are going to teach CPTED concepts in detail and help people learn to implement it in their own homes and businesses! Simply trimming hedges in such a way that it is difficult to hide behind them makes it difficult for a criminal to hide or lay in wait for a victim. Trimming shrubs below window height so occupants can see outside causes criminals to be more cautious and think they are being watched. There are dozens of strategies you can learn to make your home or business safer. Join us at our September Community Education Forum to learn more!